Super Savings Item! Save 34% on the FineDine Stainless Steel Mixing Bowls - (Set of 3) Nesting Bowls, 18/8 Stainless Steel Kitchen Prep & Serving Bowls, With Rubber Grip Handle, Easy Pour Spout and Non Skid Bottom & Measurement Markings by FINEDINE at My Beautiful Cake. MPN: FD-S1301. Hurry! Limited time offer. Offer valid only while supplies last. 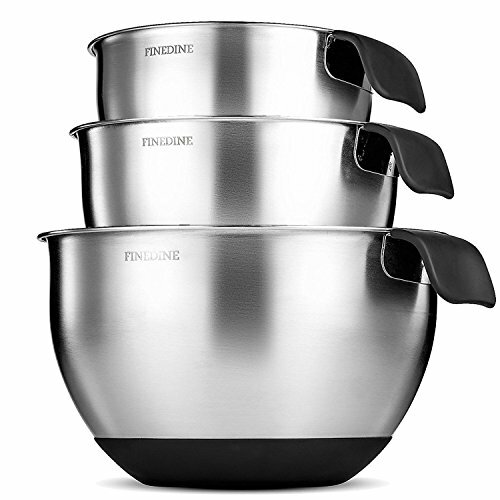 FineDine 3 piece mixing bowls set made of premium grade stainless steel and high quality rubber allow users to measure, mix, pour, and serve food all in one kitchen tool!. The metal bowls have convenient features such as a pour spout, measurement marks, rubber handle and non-slip bottom. These multipurpose bowls feature interior laser-engraved measurement marks that allow users to conveniently measure ingredients in both quarts and liters. Users can mix, beat, or whisk ingredients with little mess as the wide, deep bowls have high walls to prevent splatter. Constructed of high quality, thick gauge stainless steel; this bowl set is not only durable, it's virtually shatterproof and rust, dent resistant. The interior and curved rim are mirror polished while the exterior of the non slip bowls is matte with our FineDine signature laser engraved on the side. Convenient to use and even easier to clean; these kitchen bowls wash up easily by hand or can be placed in the dishwasher as they are 100% dishwasher safe! Presented and shipped securely in a lovely box; this set is the perfect gift for a loved on in your life! Capacities: 1.5 quart, 2.5 quart, and 5 quart.